Paul’s Daughter & Ruby’s Bar Reopen on Saturday, Restored Signs to Return! “It took time to be that iconic and it’s going to take time to put some of it back,” Paul’s daughter Tina Georgoulakos told ATZ about the work in progress at her store. 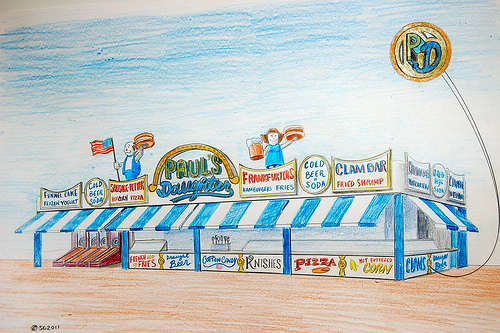 The family business was co-founded 50 years ago by her father Paul Georgoulakos, now 83, and Gregory Bitetzakis on the Coney Island Boardwalk as Gregory & Paul’s. Saturday will be the soft opening of the new Paul’s Daughter, with the grand opening scheduled for Memorial Day Weekend. Some work remains to be done in the kitchen, which will be finished and inspected next week. This weekend’s bill of fare will be limited to clams on the half-shell, Brooklyn craft beer and soda. “It’s a brand new place with the same people,” said Tina. 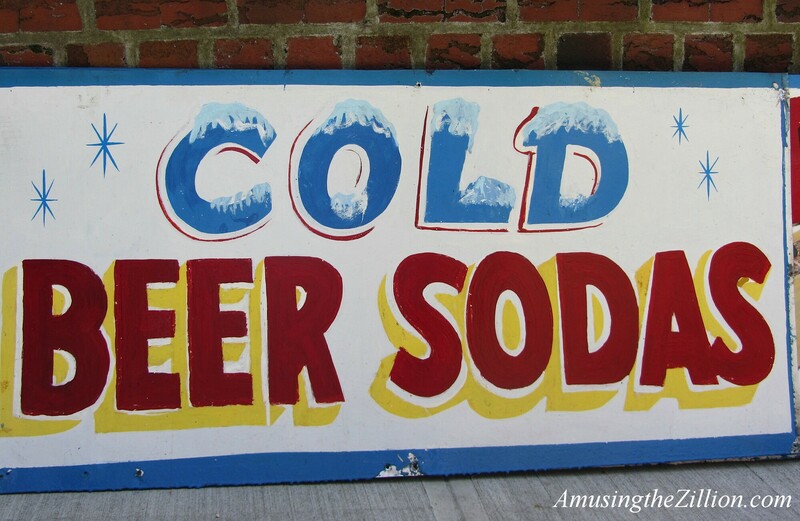 While the new lighted signs and striped awnings mandated for the Boardwalk stores have yet to go up at Ruby’s or Paul’s, the good news is that some of the quirky vernacular signage that gave both places such character will return after all! At Paul’s Daughter, the original signs will be be put up on Monday or Tuesday, said Tina, who sent us these photos of a few of the restored signs. 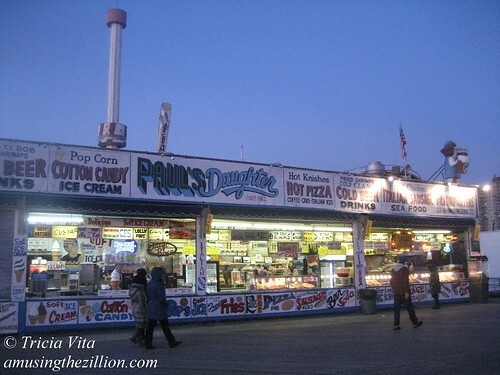 Back in November, when lease negotiations were in progress, it was heartbreaking to see the cavalcade of beloved characters and foods torn from their home on the Boardwalk building’s facade: Mr Shrimp, Chiefito and Chiefita (the Nice N Sweet/Fluffy Cotton Candy Kids), Shish Kebab (“Made with Love”) and other enticements. Some of the signage has been here since the restaurant’s earliest days and was meticulously restored a couple of years ago. The rendering for the new store released in November showed the spruced up Burger statues on the roof (where they have remained throughout this saga) and what appeared to be new hand-painted signs in the spirit of the original along the bottom. At the time Tina told us she doubted whether the age and fragile condition of the signs would allow her to return them to the building’s exterior. The happy solution was to have the thin metal signs mounted on a wood backing. The announcement of Ruby’s Saturday opening was posted on their Facebook page yesterday: “WHEW! After months of construction….Ruby’s will be open Tomorrow!!! Look forward to seeing everyone.” The bar, newly trimmed with ipe wood salvaged from the Boardwalk redo, will be open, of course. The menu, still a work in progress, will include hot dogs, hamburgers and knishes. French fries are yet to come. As we previously reported, the vernacular signage touting Hot Corn, Fried Shrimp and Shish-Ka-Bob have survived and are alive and on the inside at Ruby’s Bar and Grill. The charmingly hand-painted food and lettering surrounding the grill got a touch up and has been trimmed with recycled wood from the Boardwalk. The plastic tabletops have also been replaced with Boardwalk wood. See you there! May 22, 2012: Photo Album: Welcome Back, Paul’s Daughter & Ruby’s Bar! November 13, 2011: The End of Paul’s Daughter As We Know It–Will They Return? Just came back from Coney Island. You know, I want these businesses to survive & hope they do well, but the place is no longer the same. I appreciate the renovation work at Ruby’s, but where are the pictures?!?!? No personality without the history. And Paul’s Daughter doesn’t even look like the same place. Truly whitewashed with no signage and personality as well. I am hoping the “soft launch” means “more to come” but it all feels sad, hollow & mall-like. Yes, more to come! Even though Ruby’s and Paul’s Daughter managed to open for business, both are still very much works in progress. Signage, inside and out, and other decorative touches, are yet to be done. 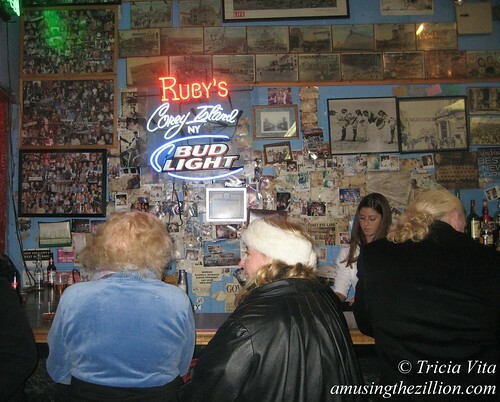 The photos are going back up inside of Ruby’s and the old signage will be returned to the bottom of Paul’s facade. Also, as I mentioned the new lighted signs and awnings mandated for the Boardwalk stores have yet to go up at Ruby’s or Paul’s. There’s something to be said for first impressions, but after reading comments about some of the other Boardwalk stores on Facebook, I would recommend holding off any critique of the Boardwalk redo until all are finished. Before and after photos will be interesting! You have to understand that these two icons were on year to year leases for the better part of three decades. Nobody in their right mind will put hundreds of thousands of dollars into renovating a place they may not have the coming year. With eight years of future secure, Ruby’s and Paul’s Daughter can finally do the upgrades they’ve wanted and needed to do for years. Will they be the same? No, not in appearance, they’ll be cleaner and less run-down. The personalities that made them the icons they are remain. A big part of these places are the people – both, the locals… and the scores of tourists that we get to have laughs with. Bring it on!